Chertoprud, E.S., Sinev, A.Y. & Dimante-Deimantovica, I. 2017. Fauna of Cladocera and Copepoda from Xinjiang Uyghur Autonomous Region (China). Zootaxa 4258(6): 561–573. doi: 10.11646/zootaxa.4258.6.5. Reference page. Ghaouaci, S., Amarouayache, M., Sinev, A.Y., Korovchinsky, N.M. & Kotov, A.A. 2018. An annotated checklist of the Algerian Cladocera (Crustacea: Branchiopoda). Zootaxa 4377(3): 412–430. doi: 10.11646/zootaxa.4377.3.5 Reference page. Kotov, A.A. 2007. Jurassic Cladocera (Crustacea, Branchiopoda) with a description of an extinct Mesozoic order. Journal of Natural History 41: 13–37. doi: 10.1080/00222930601164445 PDF. Kotov, A.A. & Ferrari, F.D. 2010. The taxonomic research of Jules Richard on Cladocera (Crustacea: Branchiopoda) and his collection at the National Museum of Natural History, U.S.A. Zootaxa 2551: 37–64. Handle. Full article (PDF). Reference page. Kotov, A.A., Sinev, A.Y. & Berrios, V.L. 2010. The Cladocera (Crustacea: Branchiopoda) of six high altitude water bodies in the North Chilean Andes, with discussion of Andean endemism. Zootaxa 2430: 1–66. Preview (PDF). Negrea, S., Botnariuc N. & Dumont H. J., 1999. Phylogeny, evolution and classification of the Branchiopoda (Crustacea). Hydrobiologia 412: 191–212. Novichkova, A. 2016. The first data on the freshwater microcrustaceans of Shokalsky Island (Russian Arctic). Biodiversity Data Journal 4: e10930. doi: 10.3897/BDJ.4.e10930. Reference page. Olesen, J. 1998. A phylogenetic analysis of the Conchostraca and Cladocera (Crustacea, Branchiopoda, Diplostraca). Zoological Journal of the Linnean Society 122(4): 491–536. doi: 10.1111/j.1096-3642.1998.tb02161.x PDF. Xiang, X.-F., Ji, G.-H., Chen, S.-Z., Yu, G.-L., Xu, L., Han, B.-P., Kotov, A.A. & Dumont, H.J. 2015. Annotated checklist of Chinese Cladocera (Crustacea: Branchiopoda). Part I. Haplopoda, Ctenopoda, Onychopoda and Anomopoda (families Daphniidae, Moinidae, Bosminidae, Ilyocryptidae). Zootaxa 3904 (1): 1–27. doi: 10.11646/zootaxa.3904.1.1 Reference page. 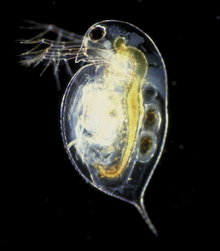 For more multimedia, look at Cladocera on Wikimedia Commons. This page was last edited on 6 March 2019, at 18:19.